Mikey Fuller | Interiors: Christmas In July! Since its been waaay hot here the past few weeks (highs over 100 plus humidity) I decided to share some COOL CHRISTMAS ideas! I hope you enjoy my Christmas decor from last year! Vintage mica snow is the base for this snowy winter display of bottle brush trees with mercury glass beads and a wonderful box handmade of vintage ephemera. Joyeux Noël! Apothecary jars full of vintage mica snow and glittered and glass snowflakes and wintery white bone and mother of pearl buttons, boxes of vintage pink Shiny Bright ornaments, fabulous blue fur glittered garland, and a papier mâché star covered in German glass glitter accented with miniature garland and mercury glass beads top the corner cupboard that formerly lived in my dining room. A glass glitter covered reindeer and glittered bottle brush trees with mercury glass beads sit atop an antique ironstone platter accented with sea glass. More bottle brush trees, mercury glass, vintage silver, and silver rocks surround this crusty cast-iron urn planted with a mercury glass Christmas tree. Here is our other reindeer friend! The beautiful cream and green hounds tooth fabric is a Better Homes and Gardens fabric sample--I got a bunch at a designer's tag sale! Each piece was about 1 yard square and bound on the edges, so I've had a lot of fun finding different ways to use them. A vintage silver candelabra gets repurposed as a bottle brush tree holder. An antique aqua bowl holds mercury glass knobs that haven't found a new home, along with mercury glass orbs, and a tiny glitter covered cottage. Here is a close-up of the buttons! I just love this little cottage. Here is my Pretty in Pink Christmas tree covered in mostly antique and vintage decorations! Glittered keys, felt chandeliers, Shiny Bright glass ornaments, stars, mercury glass and tinsel garland, and glitter dusted snowflakes fill the Pepto-hued boughs. And seeing how this over-the-top tree is fit for a princess, I topped it with not only a glittery star, but also a fab vintage rhinestone tiara! I sort of got carried away with the mantel--I didn't know when to say when! I love my chartreuse monogrammed stocking from Target! Here are a few more Christmas trees I put up--Teal Tinsel! I got these Dept. 56 trees for a song at Marshalls! I went a little more traditional in my Gothic French office/Music room-- a very traditional green artificial tree with brown and gold ornaments and a chartreuse dupioni silk garland. So it wouldn't get jealous of the Pretty in Pink tree's tiara, I topped it with a golden crown! An overtured empire cage chandelier dome seated upon an antique mirrored plateau holds a plethora of antique Christmas ornaments. This little elf is busy cutting down pink flocked bottle brush trees and harvesting freshly grown Christmas ornaments! My beautiful circa 1820 armoire is simply topped with more of the fabulous glittered blue fir garland and a German glass glitter covered bottle brush wreath. This armoire is made of chestnut--which is noted for cracking like mine is--probably why many chestnut furniture pieces have disappeared over the years. The stencils of fruit, flowers and birds is all original, along with the stenciled faux raised paneling! This baby is nearly 8 feet tall! It was a struggle to get the pediment on the top with my low ceilings! I really need to take some Murphy's oil soap to this--I've been meaning to do that since I bought it several years ago! I hope this display has cooled you off and got you thinking about your Christmas plans. I got a head start Saturday while yardsaling--I bout several hundred Shiny Bright ornaments--a combination of silver, aqua, pink, and green! 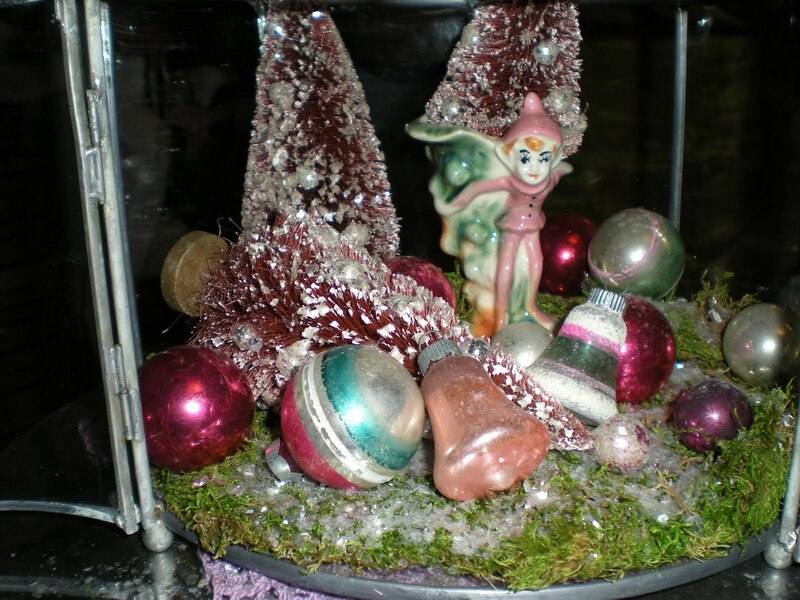 So wonderful--now I can decorate the vintage silver tinsel tree I got a few weeks before that! Woohoo! Merry Christmas from the Shabby French Cottage!